John Quinn was born in Brackaville, Coalisland. 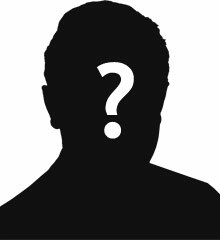 He was married to Catherine Quinn. They lived at Railway View, Dungannon. John Quinn enlisted in Cookstown. 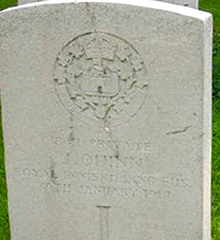 Private John Quinn was serving with the 11th Battalion of the Royal Inniskilling Fusiliers when he was killed in action near Ypres on Tuesday 30th January 1917. He is listed on Dungannon War Memorial. Berks Cemetery Extension is located 12.5 kilometres south of Ieper town centre on the N365 leading from Ieper to Mesen, Ploegsteert and on to Armentieres. From Ieper town centre the Rijselsestraat runs from the market square, through the Lille Gate (Rijselpoort) and directly over the crossroads with the Ieper ring road. The road name then changes to the Rijselseweg (N336). 3.5 kilometres along the N336 lies a fork junction with the N365. The N365 which forms the right hand fork leads to the town of Mesen. The cemetery lies 3 kilometres beyond Mesen on the right hand side of the N365 and opposite Hyde Park Corner Royal Berks Cemetery.